A while back I picked up this book at a discount store near my house. I recognized the name so I figured it would be worth reading. I have know Alister McGrath primarily as a historian, having read his books on the Reformation and John Calvin. However, this little book is considerably different than what I have read by him before. In Mere Apologetics, McGrath presents a basic overview of apologetic theory and practice. The apologetic task is a very personal one for McGrath, in that he was at one time an atheist himself. Now he is an advocate for Christianity, writing against advocates of the New Atheism like Richard Dawkins and Christopher Hitchens (e.g. Why God Won't Go Away: Is the New Atheism Running on Empty? and Surprised by Meaning: Science, Faith, and How We Make Sense of Things). As the play on the title Mere Christianity suggests and the as the author clearly states, McGrath’s approach is in many ways similar to that of C. S. Lewis (1898–1963), the famed 20th century apologist (p. 12). McGrath claims that his approach to apologetics is not “committed to any particular school of thought” (e.g. presuppositional, evidential, etc), and I got the feeling that the book takes something of an eclectic approach to the apologetic task, much like Richard Swinburne takes in his book The Existence of God. McGrath utilizes information and arguments from a variety of sources and schools to build a cumulative case for the reasonableness of Christianity, but we are perhaps getting ahead of ourselves in terms of this review. McGrath’s overall approach to apologetics in this book can be summarized in six clear statements: (1) Understand the Faith, (2) Understand the audience, (3) Communicate with clarity, (4) Find points of contact, (5) Present the whole gospel, and (6) Practice, practice, practice (pp. 35–38). 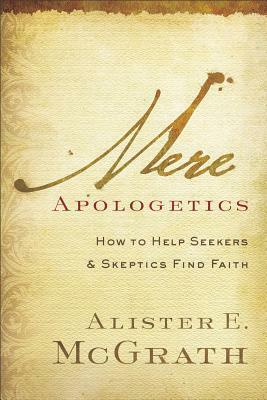 On the meaning and nature of apologetics, McGrath never offers a formal definition of the word apologetics, but he comes close when he says that the Greek word apologia “is a ‘defense,’ a reasoned case proving the innocence of an accused person in court, or a demonstration of the correctness of an argument or belief” (p. 15). McGrath sees the apologetic task as consisting in three activities. First, the job of the apologist is to defend the Christian faith against outside attack (pp. 17–18). Second, the apologist is to commend faith so that it is appreciated by those who hear about it (p. 19). Finally, the apologist is to translate the faith into contemporary life and culture (pp. 20–21). Apologetics clears the ground for evangelism, just as John the Baptist prepared the way for the coming of Jesus of Nazareth. Evangelism moves beyond this attempt to demonstrate the cultural plausibility of the Christian faith. Where apologetics can be considered to clear the ground for faith in Christ, evangelism invites people to respond to the gospel. Where apologetics aims to secure consent, evangelism aims to secure commitment (pp. 21–22). Apologetics does not and cannot convert anyone. But it can point people in the right direction by removing barriers to an encounter with God, or opening a window through which Christ can be seen. Apologetics is about enabling people to grasp the significance of the gospel. It is about pointing, explaining, opening doors, and removing barriers. Yet what converts is not apologetics itself, but the greater reality of God and the risen Christ (p. 43). Now Philip might have answered Nathanael with a detailed argument. Perhaps he might have argued that Jesus’s origins in Nazareth represented the fulfillment of a biblical prophecy. Or perhaps he might have set out the various factors that led him, Andrew, and Peter to follow Jesus of Nazareth and believe him to the be the culmination of the hopes of Israel. Yet Philip has learned that encounter is to be preferred to argument (p. 44). Arguments do not cure blindness, nor does the accumulation of evidence, powerful rhetoric, or a compelling personal testimony. Blindness needs to be healed—and such a healing is something only God is able to do. God alone is able to open the eyes of the blind and enable them to see the realities of life. Apologetics thus depends upon the grace of God and the divine capacity to heal and renew. This in not something we can do. This helps put apologetics in proper perspective (p. 45)! This paragraph should not be understood to mean that McGrath is against reasoned argumentation. In fact he devotes the entirety of chapter 5 to showing the reasonableness of Christianity. McGrath suggests two ways in which this can be done: (1) “by showing there is a good argument or evidential base for the core beliefs of Christianity, and (2) by showing that, if the Christian faith is true, it makes more sense of reality than its alternatives” (p. 72). McGrath is careful to point out, however, the limitations of apologetics in this regard. McGrath compares the case for Christianity, and the case for God’s existence in particular, to the approach of a trial lawyer. The goal of the defense lawyer is to convince the jury that his client is innocent beyond a reasonable doubt. “Apologetics works in much the same way,” says McGrath. “No one is going to be able to prove the existence of God, as one proves that ‘the whole is greater than the part.’ Yet one can consider all the clues that point in this direction and take pleasure in their cumulative force” (p. 95). It is with this understanding that McGrath utilizes what he calls “pointers to faith.” Among these “pointers” are things like the fact of creation, the apparent design and order of the universe, the moral sense of human beings possess, the innate longing people have for God, our appreciation of the beautiful, our need for personal relationships, and our inherent hope for a better life in the future. McGrath argues that Christians should utilize these and other arguments to show the harmony of the Christian worldview and remove barriers people might have to lending their ear to the message of the Gospel. Of course McGrath goes into more detail on each of these points, but you will get the gist of his approach from this brief description. 1. Be gracious: “Try to give polite, considerate, and helpful replies, especially if the question suggests that the person asking it doesn’t really understand the Christian faith, or has an inflated view of his own intellectual prowess” (p. 160). 2. Find the real question: “Apologists are often told to try and work out the question behind the question. . . . One way of dealing with this issue that I have found helpful is to welcome the question, and then ask the questioner if he would mind sharing why this is a particular concern for him. This helps me work out what the real question is and address it properly” (pp. 160–61). 3. Don’t give prepackaged answers to honest questions. In this same vein, McGrath points out that you should avoid simply borrowing answers from other apologists and use answers that actually convince you (p. 159). 4. Appreciate the importance of learning from other apologists (p. 161). Having presented the reader with some of the basic ideas McGrath presents in Mere Apologetics, I will devote these final paragraphs to a brief assessment. I will begin with the negative because I believe that for the most part this is a very good book, and I want the reader to be left with a positive impression of the book. Therefore, I will end with positive comments. By way of criticism, I offer two points. First, this book will not likely satisfy the intellect of someone who is more advanced in philosophy or apologetic methods. This book is written as an introduction and nothing more. McGrath acknowledges such and points readers to other sources at the end of each chapter. In some ways this negative is a positive (see below), but I want to reduce expectations and prevent disappointment in more advanced readers. Second, I found McGrath’s distinction between apologetics and evangelism a bit artificial. He even seems to sense this problem when he says, “The dividing line between apologetics and evangelism is fuzzy; making a distinction between them, however, is helpful” (p. 22). I am not completely denying that it may helpful to think about evangelism and apologetics separately, but I doubt it is possible to keep them separate when we actually do the work of the apologist. The goal of the apologist is something more than clearing barriers to faith or demonstrating the reasonableness of Christianity. His goal is to present Christ as someone who must be embraced as the Creator, Savior, and Lord of all mankind. The goal is repentance and faith. Our goal is to persuade people to embrace the gospel, that is, our goal is to be an evangelist. In conclusion, I want to leave the reader with some positive aspects of the book. First, the book is fairly easy to read and understand. This fact makes the book an excellent choice for people who may not have extensive backgrounds in philosophical argumentation and the like. While this book certainly contains these elements along the way, the reader is not overwhelmed with intricate philosophical proofs and arguments. No doubt part of the book’s emphasis on addressing postmodern culture, which tends to shy away from these sorts of debates, explains McGrath’s conversational style. Second, I appreciate McGrath’s recognition that, in the final analysis, the work of the apologist can never bring about genuine conversion in an individual. McGrath is right to point out that arguments do not convert anyone. He rightly believes that God is ultimately the one who changes lives. It is very important for any Christian who engages unbelievers with the Gospel to depend on the working of God’s Spirit through the Word of God to transform lives. Finally, I believe that the integrated approach McGrath takes to apologetics is useful and practical. It is important to answer the questions people are actually asking and to tailor our defense of the faith to the culture in which we live. Using information and strategy from every possible source will enhance our apologetic work. McGrath's case studies throughout the book show how a varied approach to apologetics which is adapted to a specific audience can be applied to real life situations. In sum, Mere Apologetics is a book worth reading.